As soon as my children watched Toys Story 3, it immediately became a favorite. All the Toy Story characters were already favorites around here; but Joey, Hayley and Emily quickly fell in love with all the new toys. Though we have many favorite moments and lines from Toy Story 3, there is one that all my children think is funny, and because of that, Mr. Potato Head has started to move up the ranks of favorite character around here. During Toy Story 3, Mr. 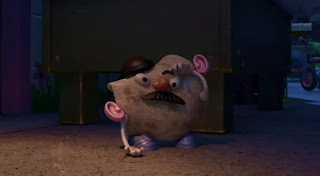 Potato Head replaces his potato with a tortilla, as part of the toys' plan to escape Sunnyside Daycare. A pigeon looks at him, and just before it starts pecking at this tortilla, Mr. Potato Head says, "What are you looking at, Feathers?" I'm not sure what it is about that line that made such an impression on my children, but they now repeat it constantly to each other and laugh hysterically every time. I took a little inspiration from this scene with Mr. Potato Head and decided to let the kids create a quick tortilla snack. For this particular recipe, you will see that there are no measurements for the ingredients. Let your child fill these with the flavors they love. It is one of the recipes that my children really love since they can just add what they want and how much they want of each ingredient. Also, you can easily adjust the ingredients to match your child's favorite flavors. Over low heat, place sauce in a small pot to heat through. While the sauce is warming, on a nonstick cookie sheet, place 3 to 4 tortillas (depending on the size of your cookie sheet). 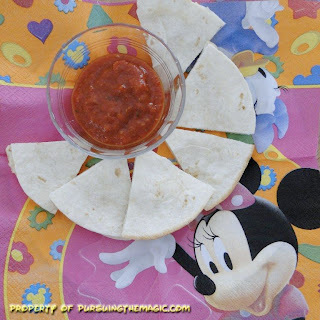 Have your child place enough mozzarella on the tortilla to cover it. Have them add 3 to 4 pepperonies on top of the mozzarella. Sprinkle parmesan over the pepperoni. Add another layer of mozzeralla to cover the pepperoni. Place another tortilla on top. Bake for about 5 minutes, though the baking time is dependent on the amount of filling in each tortilla, or until golden brown and cheese is melted. Cut tortilla into fourths and serve with the warmed pizza sauce. The great thing is, this is one of the recipes that they have the freedom to really make it their own. We've made all different flavors and versions of this, but pizza seems to be the favorite so far! Another plus, minimal dishes after cooking! I love the idea of letting kids create dishes. I think getting kids involved in cooking at an early age is great and it's the perfect way to teach them healthy eating habits too. I think creating dishes inspired by Disney movies, music, parks, etc. is such a great idea Beth! Well, thanks for letting me post them here! We'll see what is next, though Emily has suggested we "eat apples" and talk about Snow White (her absolute favorite princess). When I said we have think of a recipe for it, she recommended we just peel and eat! LOL!